The markets didn't waste any time getting down to business in 2015. While many were still recovering from over indulgence of eggnog, crude oil fell $5 per barrel in two trading sessions and the ES (e-mini S&P) has fallen nearly 80 handles in four trading days. Let's hope this isn't a sign of things to come. If you are a stock market bull, you are likely eager for this week's economic data to begin hitting the wire. Most of the scheduled reports are believed to be relatively optimistic. Particularly important will be the Wednesday afternoon release of the FOMC minutes (from the December 17th meeting) and the Friday morning employment report. Aiding volatility in the commodity and equity markets was a late 2014 announcement made by Mario Draghi suggesting the Eurozone is prepared for bond buying programs (quantitative easing, AKA money printing). In the recent past, such pledges have triggered rallies in stocks and commodities around the world, but there is a widespread consensus that this is the EU's last bullet. In other words, it feels a bit desperate and there are doubts as to whether or not it will be successful. Money has been flowing into Treasuries as of late but we have a feeling it is due to a lack of an alternative, as opposed to long-term investments. In other words, investors are likely "parking" funds in what they believe to be the best safe-haven asset until they get a better feel for how things might go in 2015. Further, the Treasury market has been held captive by central bankers in the Eurozone. Specifically, their pledge for lower interest rates helps to keep rates in the U.S. under tabs. It also creates a scenario in which the glimmer of a safe-haven shines more brightly in the U.S. simply because the Fed is in a position to ease stimulus, while Europe is still pressing on the gas. Simply put, U.S. backed securities are winning the safety war. Another thing to keep in mind is that the Euro currency and the 30-year bond futures contract have a strong negative correlation. In fact, stats spanning over the previous 180 days suggest the long bond and the Euro travel in opposite directions roughly 80% of the time. 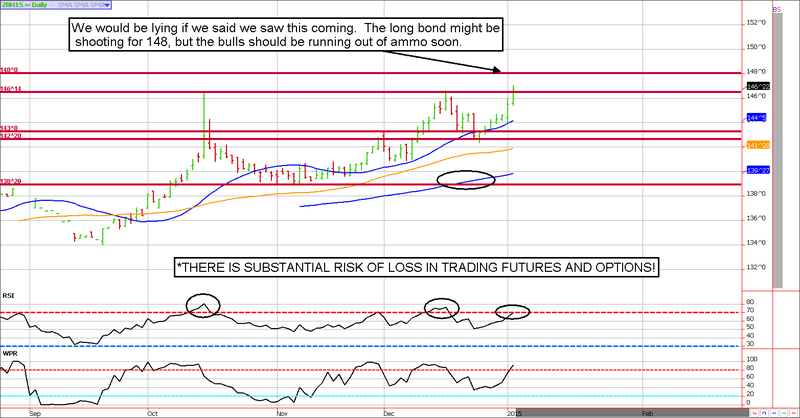 Thus, in order for Treasuries to turn the corner we'll need to see similar reversal action in the currencies. We certainly weren't counting on a Treasury rally over the holiday break, but the possibility of unusual trade during the lightest volume trading span of the year, is exactly why we recommended to play the downside in Treasuries with a long option (limits risk). **Consensus:** We are surprised to see bonds and notes moving higher. The 30-year bond could be seeking 148ish. We'll consider more aggressive bearish plays from there. **Resistance:** ZB : 148, and 149'11 ZN: 127'27, 128'15, and 129'27. The equity markets are in the midst of one of the largest, and longest, bull markets in history. We are not of the camp that believes the party is over, but we do respect the fact that markets can (and do) correct rallies. Selling in late 2014, and early 2015, feels like profit taking; if so, it should be temporary. Although we were looking for prices to see 2100, or a little higher before rolling over on profit taking, the market clearly had ideas of its own. After peaking near 2090, a week or more prior to our anticipated climax, we've seen a steady flow of sell orders. Those that opted to take profits for the 2014 tax year turned out to be far better off than those who waited to take profits in 2015 (to deter their tax bill to 2016). In our view, the regret of this decision likely lead to a bit of panic by those seeking to lock in gains. For much of the day, there seemed to be little care for price or technical analysis. It was simply a race to liquidate. Now that we've come this far, the most likely target for the bears will be 1976ish. Nonetheless, intraday charts are massively oversold, so we'll likely see a bounce overnight or tomorrow morning before the bears get back to work. **Consensus:** We tend to be optimistic in the long-run, but in the short run 1976 could be in play.